To commemorate the global Earth Hour campaign, Engro participated in the Earth Hour celebration to raise awareness on changing our lifestyles to reiterate their commitment towards a better tomorrow. 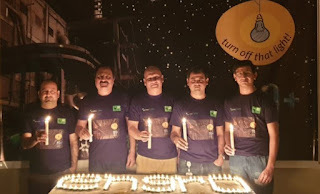 Through the Earth Hour and related events, Engro aims to play its role as a responsible corporate in creation of an environmentally aware society for promoting a change the way live matching this year’s theme of Earth Hour. Speaking at the ceremony, Wajid Junejo – Plant Manager, Engro Zarkhez plant, said, “We as Engro are passionate about ensuring that our policies and procedures are environmentally friendly. Over the years, Engro has supported most of the global initiatives to protect the environment and educate employees as well as other stakeholders for a brighter tomorrow. Today, on Earth Hour 2019, we pledge to remain focused on playing our part to bring the change in our areas of influence. Engro is an environmentally-aware and a responsible company and has initiated various programs of action that are ecologically favorable and in connection with the development and sustainability of the environment. Green Office Initiative is one such program, aimed at reducing Carbon Dioxide (CO2) emissions and workplace environmental footprint. Since its inception, Engro’s Green Office Initiative has advocated a culture of environmental responsibility enabling the workforce to act in eco-efficient and conscious manner in everyday tasks and has improved environmental awareness in cost-efficient ways. As a result, Engro was able to reduce its electricity consumption and registered 42% conservation of electricity. Similarly, a 56% reduction in paper usage, 82% reduction in waste and 44% reduction in carbon foot print against baseline benchmarks were also witnessed. Acknowledging Engro’s efforts, WWF-Finland bestowed the Best Green Office Award and WWF-Pakistan honored Engro with Silver Award of Achievement. These awards were conferred in recognition of Engro’s substantial reduction in our environmental footprint.